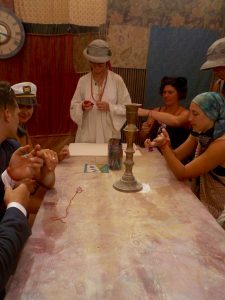 I had the honor of leading an Intentional Creativity activity at the Burning Man art festival in fall of 2016. 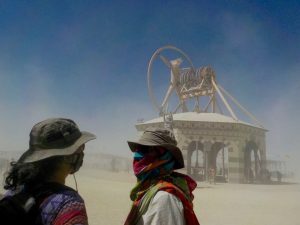 I don’t know how many of you have been to Burning Man – I myself had only learned of its existence a few years ago, as I ogled stunning photographs of large-scale art installations in an extremely isolated, expansive desert landscape. For those of you who may not be familiar with Burning Man, it began in 1986 as a gathering around a bonfire on Baker Beach in San Francisco, and has now become a MUCH larger gathering – more than 80,000 people come together in the “pop-up” Black Rock City location in the Nevada desert 110 miles north of Reno, Nevada. are the three of several major principles of Burning Man: accept yourself completely, accept the way others are, and leave no trace of your presence once the festival is over. The focus is on art primarily with tons of music. There is lots of partying and very little sleep, while camping in a VERY harsh desert environment: blistering heat during the day, near freezing temperatures at night, with dust storms occurring briefly nearly every day, coating everything you own – everything! with a fine layer of white dust. The activity I lead was called “Cosmic Cowgirl Affirmation Cards”, and took place in a room at the base of the Man – the effigy that is the symbol of the entire festival. The focus of the session was on transforming the negative stories we’re told from childhood – you’re disorganized, you’re bossy, you’re too talkative – into positive affirmations, such as you can focus on many different things at once, you know how to take command & get things done, you have the gift of eloquence. we begin to understand that these stories are not who we are. And what better venue to focus on self-acceptance than here, at the foot of the Man in the heart of the Burning Man festival, where radical self-acceptance is one of the key elements of the entire Burning Man experience? I was impressed how a few pieces of paper, some sharpies, a table, and the Intentional Creativity approach was enough to create a mind-opening, sacred experience for at least one participant: a very well-dressed, dapper gentleman somewhat older than the average age range of the typical Burner, as the participants of Burning Man are called. After a Red Thread ceremony in which we remind each other how we’re all connected by a common link, a red thread bringing us to this moment where we are destined to meet each other, the activity begins by listing all the negative statements, the stories we are told over and over again: you are so impatient, you’re too slow….etc. The well-dressed gentleman had quite a long list, taking a bit more time than the other participants to write them all down. The next step in the activity is to take each negative story and rephrase it in a positive light on a card kept for future use. The negative statements were then taken to one of the fire pits scattered around Black Rock City and ritually burnt. As the dapper gentleman ticked off each negative story on his list and replaced it with a positive statement, it was like watching a small crack in a cloudy sky growing bigger and bigger, letting more and more sunlight pour through the opening…. which demonstrates how Intentional Creativity can be done with a very simple process and only a small amount of materials and still bring very powerful insights. I’m grateful to the teachings of Shiloh Sophia McCloud Lewis and the support of her husband Jonathan Lewis which resulted in my offering of this beautiful gift and process during Burning Man. The festival’s credo is Leave No Trace – and indeed, no physical trace remains of the city of more than 80,000 people and its art installations. 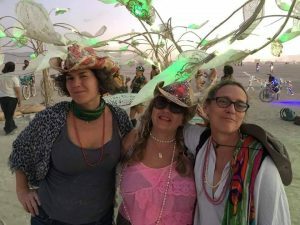 But the invisible impact of attending Burning Man can be profound, and I’m honored to have contributed my small grain of sand, thanks to Intentional Creativity and its Cosmic Cowgirls. 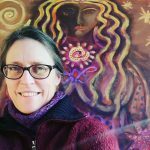 Dr. Lorraine Tilbury is a visionary artist, horsewoman and teacher, helping gifted youth, women and professionals connect to their true calling. She had many wild childhood dreams and is fulfilling them now: she’s a multilingual veterinarian, living in a 16th-century renovated priory in the beautiful Loire Valley region, surrounded by her family and her animal companions. Lorraine works with a herd of horses who are guides in her workshop experiences. She is a regular contributor to BBC Capital’s online magazine, with speaking engagements from India to Arizona, with Paris in between. Lorraine is developing a body or art work while working with the method of Intentional Creativity©, a powerful way to focus projects and life plans through creative expression. Lorraine works with journal techniques like sketching, collage, scrapbook, and painting to guide you on your way to personal & professional success. The horses may whisper in your ear to guide you as well! Lorraine’s art has been described as inspirational and whimsical – a reflection of the way she lives her life, by connecting to her Inner Self through her creations. She brings into form the wisdom of her Soul in a way that showcases the fertility of her imagination.